San Pancho is a place with many opportunities for young children and families – especially opportunities for education and building skills. In our town, you’ll find public schools from kindergarten through middle school, an amazing community center for after school programs but, also for the past 8 years, a small cooperative parent-run school has been a second home to many families. Escuela del Mundo began with less than a dozen students with families looking for a broader educational experience (Montessori based with Arts and Ecology as principal elements). Now, the school has over 50 students in its preschool and elementary classrooms and is recognized by the state of Nayarit for its innovation and “green” approach to education. We are proud to announce two important events at Escuela del Mundo in February. SCIENCE FAIR, open to the public, is always fun and inspiring. Our young scientists have been preparing their experiments and investigations which they will soon present in front of parents and the community. The 3rd Escuela del Mundo Science Fair will take place on Thursday, February 20th at Noon in the school garden. Open to friends and the entire community. Science lovers will definitely enjoy this important presentation by our inspired young scientists! 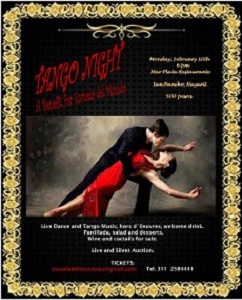 TANGO NIGHT BENEFIT DINNER & PERFORMANCE – as a non profit organization Escuela del Mundo relies on its annual benefit as well as the support of many volunteers and individuals throughout the year to sustain its mission and to continue providing quality education for many families. This year, Mar Plata will host the Tango Night Benefit Dinner for the school on Monday, February 10th at 6:00pm. $500 pesos entrance includes a fabulous Argentina Grill Banquet, live Tango performance and music, welcome cocktail and a wonderful evening among friends in support of one of San Pancho’s important projects. Reserve your table by calling the school 311-258-4441 or director July Ferrara cell 322-138-5199.